In downtown West Palm Beach, Mary and Matt had a great time with DJ Steve O! Danielle and David love Let’s Party! What a FUN wedding! Special thank you to Bill Barbosa Photography, LK Video, and our friends at Admirals Cove in Jupiter, FL! Company Parties love Let’s Party! To help Biotest celebrate opening up their 16th location, we helped them celebrate with their “1950s Themed Sweet 16 Event!” Needless to say, we played a bit of everything!!! Thank you to Biotest for having Let’s Party! at their company party! Let’s Party! Rocks The South Florida Women’s Expo! 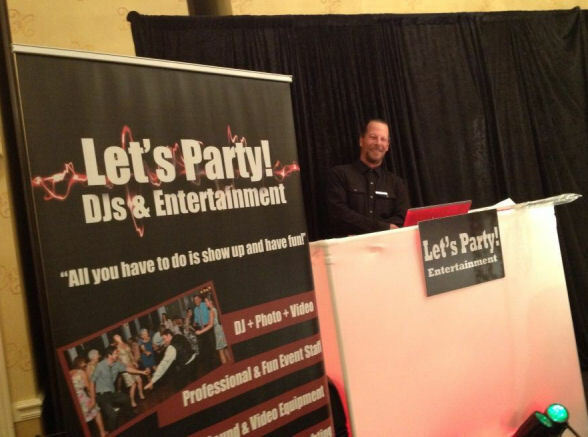 DJ Buddy not only hosts but plays auctioneer and game show host. Yes, the man can do it all. Katrina (our General Manager and Web Guru) poses with belly dancer Heather Phoi at our table. DJ Sandy ready to rock the house. 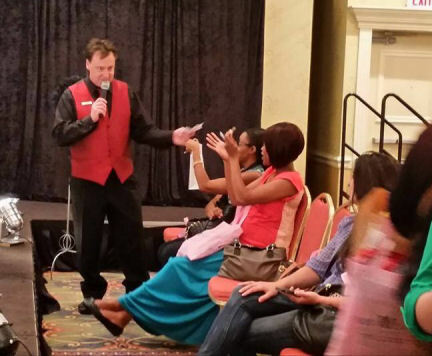 We had a great time providing the entertainment for the South Florida Women’s Expo. Thank you to April Iannazzone, the Expo crew, and CityPlace Marriott for having us! Dare to stand out! To add a bit of “you” to your wedding, you might try experimenting with these Spring Color Trends! Can you imagine a wedding in Dazzling Blue or Celosia Orange?